"The decision is Lillehammer". 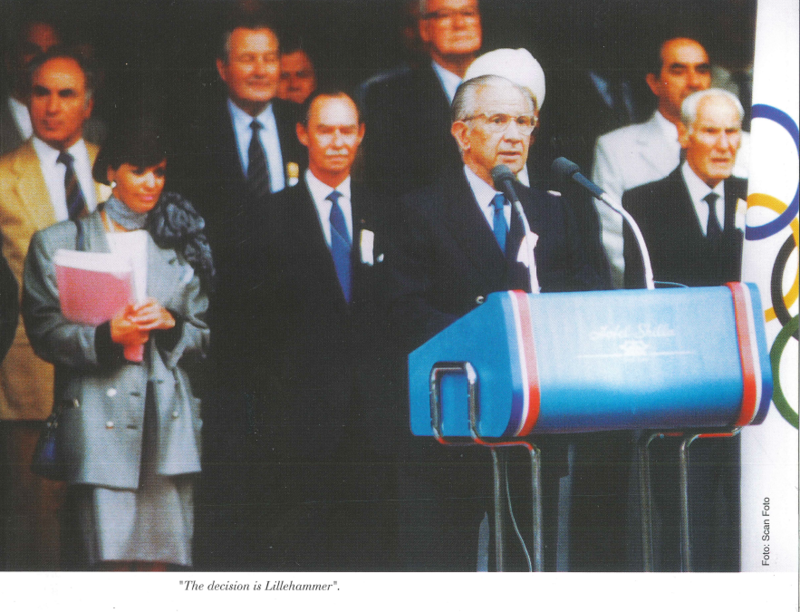 We will never forget those words uttered by the IOC President Juan Antionio Samaranch in Seoul in 1988, when Norway was chosen to host the 17.th winter Olympic Games. This presented a huge challenge and involved the construction of several large sports facilities. The municipality of Gjøvik was given the challenge of staging several of the ice-hockey matches, and since the town did not possess one - a new arena had to be built. Norway is a mountainous country – more than 50 percent of the landsurface is exposed rock. The country has deep-rooted traditions of building underground constructions. When Gjøvik was selected as an Olympic arena, it was natural to consider building an underground ice-rink, linked to the exisiting swimming pool.The idea had no doubt been contemplated before, but one episode in particular stands out as a decisive factor to this «wild idea». The swimming pool was designed by a firm of consultants from Oslo. One day, late in the autumn of 1989, Mr. Jan A. Rygh an engineer and the firms Technical Manager, and the Municipality Enginer of Gjøvik – Mr Helge Simenstad inspected some of the work the company had carried out on the underground swimming pool. At the end of the day – at dinner, Mr Simenstad revealed that Gjøvik had been chosen as the site for the icehockey arena for the Winter Olympics. Mr. Rygh says that he felt as if struck by lightning. For several years he had longed to build a huge underground cavern and was convinced that this was technically feasible. In answer to Mr. Simenstad’s news, he exclaimed , «Lets build a cavern in the mountain! What do you think ?» The two engineers stayed at the table for a long time that evening, drawing the first sketches of the underground icearena on a napkin. It was the beginning of a hectic period – the battle was on for the best alternative. Gjøvik municipality employed the best engineers and experts to carry out the planning. The project aroused great interest among experts throughout the country, researchers, consulting engineers and arhitects alike – who all pulled together to complete the job. Several companies and instituitions pledged their financial support for this part of the project. The toal project was led by consulting engineers, Fortifikasjon AS. The Gj¢vik Olympic Mountain Hall can be used for more than just ice hockey. It is a multipurpose arena in the true sense of the word, offering fantastic opportunities for a range of sporting and cultural activities, as well as exhibitions, trade fairs, festivals and conferences. Large concerts has been arranged in the arena and Gj¢vik Mountain Hall is the leading concertarena in eastern Norway. The aim of the Municipality of Gj¢vik was to increase its long-term competitiveness by way of the Olympics. The status of the arena has resulted in the following knock-on effects. – A new data-processing center for Postdirektoratet – (Norwegian Directorate of Postal Services) adjacent to the Olympic arena. -The Mj¢s-promenade with its meeting point, made of stone taken from the Mountain Hall. – the High street – storgaten was pederstrianised. – Increased tourism – the number of overnight stays at hotels has increased by over 70 percent.